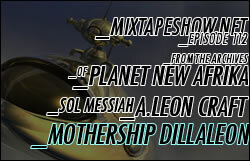 This entry was posted in episodes and tagged aleon craft, dilla, episodes, labratz, sol messiah, soultronica by dex digital. Bookmark the permalink. Out of this world…what more can I say? shout out to my boy dex man at one point i had all your podcast man i had to restore da pod but ay man also id like to give bigg ups to the dude that made that concrete complications ay thats dat exclusive mes right there but ya mann keep up the good work i noticed you aint make a podcast in a minute been worried about ya bro but ay man keep it real YE out!